“Block Content” option is special. If you enable this function, the plugin will erase all cookies that were saved by third-party scripts every time, until the user will give the consent. Block Cookies. Remove all Cookies for visitors on your site domain if user did not agree with your GDPR Policies. Block also without Agree. By default, this options will block GDPR disallowed content only if user Rejected your Policies. But if you can enable option, all required content will be blocked until user will not Agree with your Policies. In our opinion, this solution corresponds to the requirements of the GDPR by 100%. 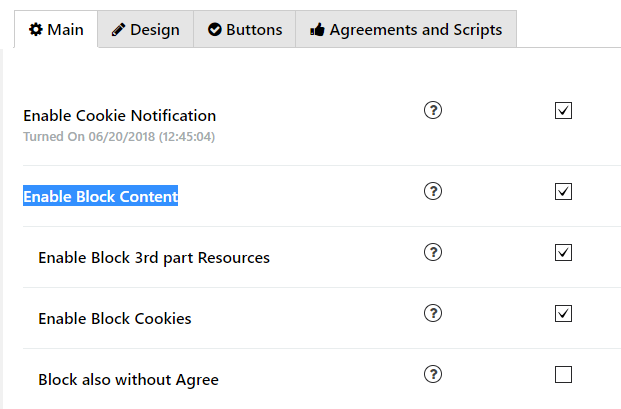 Because every time then user updates the page, and even if cookies already have been uploaded — cookie files will be deleted until the visitor will give permission to use them. Using this method, the user can be completely sure in confidentiality. As you understand, this function is not simple and you need to use this option carefully. Note that “Block Content” can crash the website and bring some issues. For example, option can remove your Google Analytics data for those users who do not agree with your policy GDPR and it will disrupt your Analytics in general. If you still have some questions about Compliance Plugin, or you want to get some information How to fight against cookies and why or maybe you still not sure what is GDPR mean, feel free to ask any information via Support Contact Form and Supsystic Team will respond ASAP.